The Opposition People’s Progressive Party (PPP) on Monday filed a High Court action, asking that President David Granger’s appointment of Retired Justice James Patterson as Chairman of the Guyana Elections Commission (GECOM) be quashed because he is allegedly biased and the Guyanese leader violated the Constitution by picking him. “In all the circumstances, the exercise of the President’s discretion and the decision which has resulted therefrom is unreasonable, arbitrary, capricious, procedurally improper, unconstitutional, influenced by improper motives and made in bad faith,” states PPP Executive Secretary, Zulfikar Mustapha in court papers seen by Demerara Waves Online News. Chief Justice, Roxane George-Wiltshire is Tuesday expected to fix a date to begin hearing by the Constitutional Court. 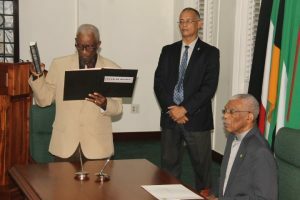 Retired Justice James Patterson taking the oath of office before President David Granger as the new Chairman of the Guyana Elections Commission. .Mustapha wants the High Court to declare that Granger’s October 19, 2017 appointment of Justice Patterson violates Guyana’s Constitution and is “accordingly unlawful, illegal, unconstitutional, null, void and of no effect” and he is not constitutionally qualified to be appointed GECOM Chairman. Further, the applicant is asking the Court to grant an order “rescinding, revoking, cancelling and setting aside the appointment” of Patterson. 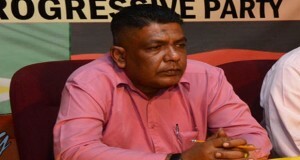 The PPP parliamentarian is further asking the High Court to choose a person from the 18 names that have been submitted by Opposition Leader, Bharrat Jagdeo in three separate lists of six persons each. The several grounds cited are that Patterson does not have the required integrity to serve as GECOM Chairman because he was the Chief Justice of Grenada as stated in his overview of his education, qualifications, and previous occupations. Further, the PPP executive member said Patterson cannot be or appear to be politically impartial and independent in the discharge of the functions of his office on the grounds that he is a member of the advisory Committee on the Prerogative Mercy appointed by the President; an advisor to the Attorney-General and Minister of Legal Affairs appointed by the President, the Attorney-General or someone in the President’s Government; was appointed by the President to head a Commission of Inquiry into a prison break at Georgetown, Guyana, during the month of July, 2017 and he was appointed by the President to be part of a panel to reviewing applications for the positions of Chief Justice and Chancellor of the Judiciary. Politically, Mustapha said Patterson was a pallbearer at Merriman’s Funeral Home at the funeral of former President Hugh Desmond Hoyte. “This was a service which proceeded the State Funeral at which members and supporters of the People’s National Congress attended; all the other pallbearers in relation to that part of the ceremony were People’s National Congress Party leaders, activists and supporters” and that he is a member of the Facebook group, ‘Rally around the People’s National Congress (PNC). Patterson, notes Mustapha, is a reverend and a Christian activist and therefore offends against one of the qualities of the Chairman of GECOM as stipulated by the President. With regard to specific constitutional violation, Mustapha states that the President has no power to unilaterally appoint a GECOM Chairman once a list of six names is submitted to him by the Opposition Leader, and the President has failed to give any reason for deeming as unacceptable, 18 names of “outstanding Guyanese produced by a consultative process involving several important stakeholders, organizations and the Leader of the Opposition. Mustapha said by making a unilateral appointment of a Chairman of GECOM, the President has destroyed a vital and delicate balance which the framers of the Carter Formula, which was codified in Article 161(2) of the Constitution, intended, that is, that GECOM shall consist of three Commissioners representing the Government and three Commissioners representing the Opposition, presided over a Chairman produced through a consensual process involving the Leader of the Opposition and the President. The PPP, through Mustapha, intends to support its case by presenting a copy of a letter dated December 21, 2016 containing a list of six persons sent by the Opposition Leader, a bundle containing the curriculum vitae of the list of six persons contained in a letter dated the 21st day of December, 2016, sent by the Leader of the Opposition to the President; a copy of a letter dated the 5th day of January, 2017, sent by the President to the Leader of the Opposition indicating that the former had found the six persons provided to him as, ‘unacceptable’; a copy of a letter dated the 14th day of March, 2017, addressed to the Leader of the Opposition from the President in which the latter enumerated a list of, ‘qualities of the Chairman of Guyana Elections Commission’; a copy of a letter dated the 2nd day of May, 2017, in which the Leader of the Opposition submitted the names of six more persons to the President to appoint one person as the Chairman of GECOM in accordance with and in pursuance of the provisions of Article 161(2) of the Constitution; a bundle containing the curriculum vitae of the list of six persons contained in a letter dated the 2nd day of May, 2017, sent by the Leader of the Opposition to the President; a copy of a letter dated the 2nd day of June, 2017, sent by the President to the Leader of the Opposition indicating that the former had found the six persons, ‘unacceptable’; a copy of the Joint Public Statement issued by the Government and the Leader of the Opposition on the 12th day of June, 2017; a copy of a letter dated the 25th day of August, 2017, sent by the Leader of the Opposition to the President in which the former submitted to the latter the name of six more persons to appoint one of the persons on that list as the Chairman of GECOM; a bundle containing the curriculum vitae of the list of six persons contained in a letter dated the 25th day of August, 2017, sent by the Leader of the Opposition to the President; a copy of a letter dated the 19th day of October, 2017, hand delivered to the Leader of the Opposition indicating that the President had found the six persons, ‘unacceptable’; a copy of the curriculum vitae of Reverend Justice (ret’d) James Aloysius Patterson; a copy of documents printed from the People’s National Congress Party website; a printout from Facebook’s website showing Reverend Justice (ret’d) James Aloysius Patterson profile and his membership of a group, under the name and style, ‘Rally around the People’s National Congress (PNC) Group’.